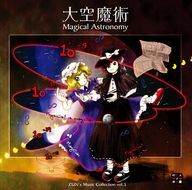 Celestial Wizardry ~ Magical Astronomy (大空魔術　～ Magical Astronomy, Oozora Majutsu ~ Magical Astronomy) is an official doujin album by Team Shanghai Alice released on 2006-08-13 (Comiket 70). It is part of "ZUN's Music Collection" and it is the fifth volume (vol.5). Dolls in Pseudo Paradise • Ghostly Field Club • Changeability of Strange Dream • Retrospective 53 minutes • Magical Astronomy • Unknown Flower, Mesmerizing Journey • Trojan Green Asteroid • Neo-traditionalism of Japan • Dr. Latency's Freak Report · Dateless Bar "Old Adam"
Ghostly Field Club · Changeability of Strange Dream · Retrospective 53 minutes · Magical Astronomy · Trojan Green Asteroid · Neo-traditionalism of Japan · Dr. Latency’s Freak Report · Dateless Bar "Old Adam"
Ghostly Field Club · Changeability of Strange Dream · Retrospective 53 minutes · Magical Astronomy · Unknown Flower, Mesmerizing Journey · Trojan Green Asteroid · Neo-traditionalism of Japan · Dr. Latency's Freak Report · Dateless Bar "Old Adam"
This page was last edited on 20 April 2019, at 16:00.